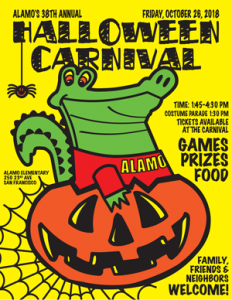 The 36th annual Alamo Halloween Carnival will take place on Friday, October 26, 2018 from 1:45 to 4:30pm and kick off with a costume parade starting at 1:30pm followed by games, activities, food, a climbing wall and more Halloween fun! Carnival participation forms coming soon! Every ALAMO student will be receiving 20 tickets! Students must turn in completed participation forms to receive their tickets. Room parents will be collecting donations to cover our operating costs. The goal is to collect $10 per student. The ticket booth will be open from 9am the day of Carnival for siblings, parents, friends and neighbors to make their purchases. Cash, checks and major credit cards accepted. Carnival is open to all Alamo families, friends and neighbors!